Adams Orthodontics is your premier choice for Valdosta and Thomasville braces and Invisalign! Dr. Adams and his team love helping kids, teens, and adults achieve beautiful and healthy smiles they can enjoy for a lifetime. Because we know that each patient we serve is unique, we offer numerous treatment options at our practice. Below are the types of braces Dr. Adams uses to improve smiles. 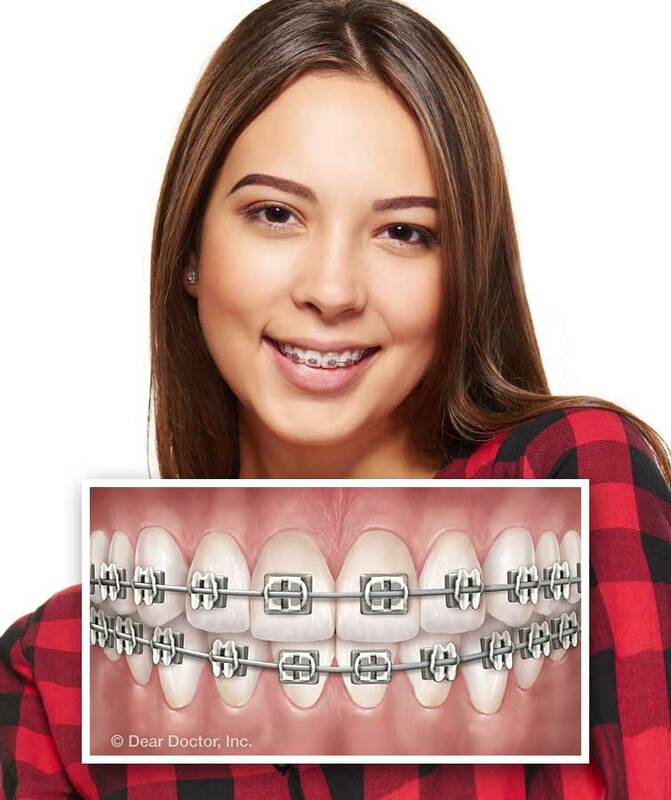 Compared to the bulky metal braces used in the past, today’s modern metal braces are better looking and more comfortable to wear because they’re smaller. 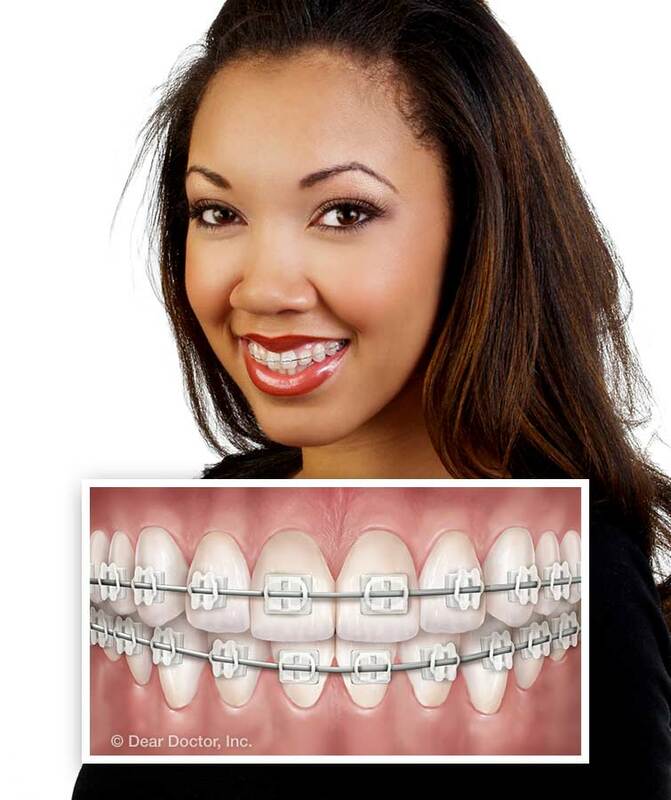 These braces consist of high-quality stainless steel bands, brackets, and archwires. If you choose metal braces, you can have some fun personalizing your treatment by using colorized elastic ties (rubber bands). If you don’t mind wearing visible braces that are cemented to your teeth for the entire time you’re in treatment, metal braces may be perfect for you. The Damon System self-ligating braces we offer are similar to metal braces but have a few extra features that make them unique. Self-ligating braces don’t use any elastic ties like metal braces. Instead, they have a built-in “sliding door” mechanism that holds the archwire in place with little friction, while allowing it to slide freely back and forth. This helps accelerate tooth movement and allows for a more comfortable treatment experience. Because treatment time is shortened with these braces, there are fewer appointments to keep with your orthodontist, to free up more of your time. You can even choose brackets made of a transparent ceramic material instead of stainless steel, to make your treatment discreet. Many of our adult patients choose to wear clear ceramic braces because of how discreet they are. While they work in the same way as metal braces, the brackets on ceramic braces are made from a translucent ceramic material that makes them hard to see. When you’re wearing ceramic braces, you can breeze through your treatment knowing that people are concentrating on you and not a mouthful of metal, to give you all the self-confidence you need! Unlike regular braces that are cemented to the teeth and easy to see, Invisalign is a removable and discreet treatment option we offer our adult patients with certain orthodontic issues. Invisalign consists of a series of custom-made, clear, removable aligners that are worn over the teeth. When you’re wearing Invisalign, you don’t have to worry about your appearance because most people won’t even see the aligners in your mouth. And since the aligners are removable, you just take them out at mealtime and when cleaning your teeth, for a convenient and hassle-free treatment you’ll love! Most teenagers view braces as being awkward, uncomfortable, and an eyesore at a time in their lives when appearance is very important. However, reluctance to wear braces should never prevent your teen from getting the orthodontic treatment he/she needs. Fortunately, there’s a version of Invisalign that’s been designed exclusively to meet the special needs and desires of teenagers and it’s called Invisalign Teen. While these clear, removable aligners function just like the aligners used with Invisalign for adults, Invisalign Teen aligners are unique. The aligners have tiny “blue dot wear indicators” on them that tell the teen when it’s time to change aligners. There are also a few replacement aligners available in case some are lost or broken. This very popular treatment option provides teens with discreet, effective, and convenient treatment they can feel good about! At Adams Orthodontics, your smile is our top priority! With two office locations in Valdosta and Thomasville, GA, we make it very convenient for your family to achieve your most remarkable smiles. Please contact us if you have any questions about the braces we use or if you’d like to schedule your first visit with Dr. Adams.